The decision made by the UK’s Secretary of State for Housing, Communities and Local Government (Secretary of State) to confirm the Compulsory Purchase Order (CPO) of Seven Sisters Market in the London Borough of Haringey, threatens the ability of London’s Latin American community to effectively enjoy their culture as provided under international human rights law, says Minority Rights Group International (MRG). On 9 April, traders from Seven Sisters Market appealed the Secretary of State’s decision, which reasoned that since the development, which is part of the Wards Corner Regeneration Project, contemplates a space for a new indoor market as well as a temporary space for the current market during construction, it does not deny the market traders their right to exercise their culture. ‘The outcome of the CPO process is extremely concerning because the Wards Corner Regeneration Project is part of a broader pattern of gentrification taking place across London that disproportionately impacts minority communities and represents a threat to their cultural life,’ says Jennifer Castello, MRG’s Legal Director. 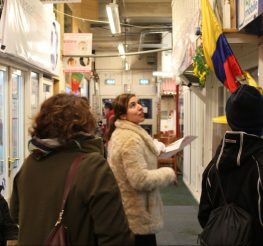 Located in north London’s Tottenham district, Seven Sisters Market is and indoor market that houses the UK’s only Latin Village known as ‘Pueblito Paisa’, the second largest concentration of Latin businesses in the UK. It currently comprises about 47 Latin American food, cafe and retail units, as well as an estimated 60 units on the mezzanine floors, and has operated as a vibrant cultural hub for the Latin American community in London since the 1990s. For over a decade, the owners of the stalls have been involved in a legal battle with the Haringey Council and multinational developer Grainger, who want to demolish the market and build a modern shopping centre and apartments. In October 2016, the Council served the site with the CPO to which the traders objected and in July 2017, the Secretary of State held a public inquiry to determine the fate of the market, issuing a report which served as the basis for its recent decision to confirm the CPO. As part of the public inquiry, MRG authored an expert statement with Law Professor Alexandra Xanthaki from Brunel University, concluding that because the market traders are entitled to special protections afforded to minorities under international law, the development project should not go ahead. UN human rights experts also expressed concerns, noting that the regeneration project represents ‘a threat to cultural life’. This reality underscores how the Secretary of State’s decision under-values the importance of the Seven Sisters Market to the Latin American community as a cultural hub in London and fails to adequately protect the rights of the market traders, and the wider London Latin American community, as members of a minority group. As UN human rights experts have pointed out, local authorities involved in approving the CPO ‘have failed to adequately assess and mitigate the impact of the project on the cultural rights of minorities, including children’. Save Latin Village & Wards Corner CIC is a social enterprise advocating to save the Latin Village. It has launched a Crowdjustice page to raise legal funds to oppose the CPO and the Seven Sisters Market demolition. Minority Rights Group International is the leading international human rights organisation working to secure the rights of ethnic, religious and linguistic minorities and indigenous peoples. We work with more than 150 partners in over 50 countries.